(1 photo of a 1966 Wimbledon White Mustang Shelby GT-350 Fastback) Emmanuel Theux sends us this photo of a Wimbledon White 1966 Shelby GT-350. This was taken at a car show in Paris, France. This one wears a set of 1965 Shelby wheels. Check out all the over vintage Mustangs in the background. (7 photos of a 1966 Wimbledon White Mustang Shelby GT-350 Fastback) This is a real Wimbledon White 1966 Shelby GT-350 fastback. It is a "carry-over" car. The first 252 Shelby GT-350s for 1966 had 1965 Mustang bodies and 1965 Mustang serial number plates under their Shelby serial number plates. These "carry-over" cars had mostly 1965 features including standard Koni shocks and their engines where painted black instead of blue. (5 photos of a 1966 Sapphire Blue Mustang Shelby GT-350 Fastback) Sapphire Blue 1966 Shelby GT350 fastback owned by John Drysdale from New York. This is our featured Attitude Of The Week for the week starting May 27, 2012. It has the original 289ci V8 and a manual transmission. John adds, "I just came to own it, but have known the car and family since 1972. It's a survivor car that's completely original and unrestored. It has always had TLC and never abused! It has 53000 'actual' Miles! With original docs. All the ones I see for sale have 30000-50000 miles! Seriously!! No way!! You better have a pile of paper work, oil changes and inspections to go with it." (1 photo of a 1966 Raven Black Mustang Shelby GT-350 Hertz Fastback) Raven Black 1966 Shelby GT-350H Mustang fastback with a 306hp (at 6000rpm), 289 cubic inch, 4 barrel, V8 engine. 1000 of these black with gold stripe GT350 cars were purchased by Hertz as part of a promotion. This photo is available in two wallpaper sizes; 1024-683 wallpaper and 2400-1600 wallpaper. (3 photos of a 1966 Sapphire Blue Mustang Shelby GT-350 Fastback) Sapphire Blue 1966 Mustang Shelby GT350 fastback with Shelby front fascia and grille with off-center emblem, hood scoop, Shelby 1966 production wheels, white GT350 side stripe, Lemans over the top white stripe, and hood pins. This car has its original 306hp (at 6000rpm), 289 cubic inch, 4 barrel, V8 engine. (5 photos of a 1966 Ivy Green Mustang Shelby GT-350 Fastback) Ivy Green 1966 Mustang Shelby GT-350 fastback with white LeMans stripes and 14-inch 10-Spoke aluminum Shelby wheels. It has the Borg Warner aluminum T10 4-speed manual transmission, fiberglass hood with steel frame, override traction bars, open letter Buddy Bar Cobra valve covers, dual Rotunda mirrors, and a remote trunk release installed by dealer. (3 photos of a 1966 Candy Apple Red Mustang Shelby GT-350 Hertz Fastback) Candy Apple Red 1966 Mustang Shelby GT-350H Hertz Rent-A-Racer with gold stripes. This one has the 10-spoke Shelby 14-inch wheels. The Shelbys for 1966 had clear quarter window glass - unless it was a 1965 Shelby carry over car. (1 photo of a 1966 Raven Black Mustang Shelby GT-350 Hertz Fastback Advertisement) Here is one of the Hertz Shelby GT500H advertisements from 1966. Yes, that is a blurry image. The GT350 is cook'n. It says, "There are only 1000 of these for rend in the entire world. Hertz has them all. It's the Shelby G.T.350-H. Only Hertz rents it. Cobra engine. Disc brakes. High speed wheels and tires. Stick shift or automatic. Rally stripes. High performance shocks. Torque controlled rear axle. The whole load. Why a rent-a-car with all this performance? We could have gotten a fleet of high-powered pseudo-sports-cars. But we figured you'd want to try a champion. Not just another imitation. So we got the one car that holds the Sports Car Club of America National Championship. And you can rent this 4-seater G.T.350-H from Hertz in most cities for a day. Or longer. But only from Hertz. Two stipulations. You have to be at least 25 years old. And you have to hurry. (It's all on a first-come-first-serve basis.) So make your reservation today. One local phone call reserves your car here. Or just about anywhere in the country. 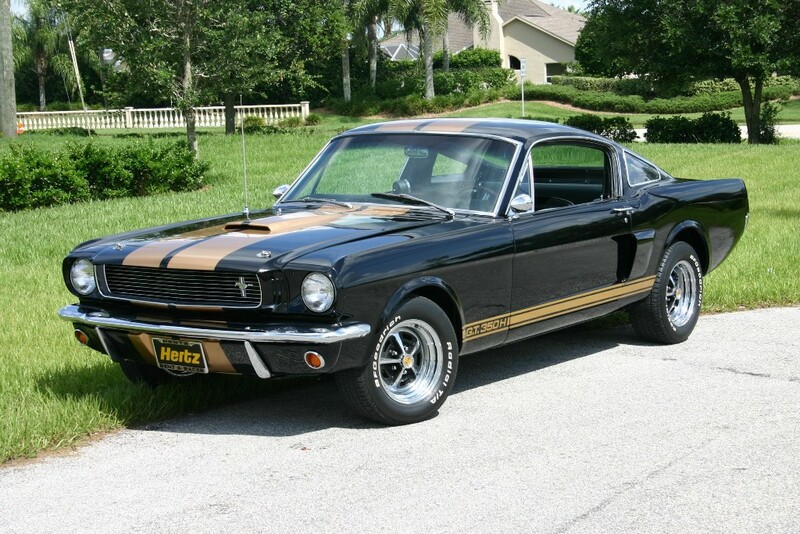 Call the only rent-a-car company that offers you a championship G.T.350-H."
(5 photos of a 1966 Mustang Shelby GT-350 Hertz Fastback Advertisement) Hertz presents the G.T. 350-H This is the cover of one of the original 1966 Hertz brochures advertising the Mustang Shelby GT350H. It says, Shelby designed, cobra bred, Ford powered, and rented exclusively by Hertz. (3 photos of a 1966 Raven Black Mustang Shelby GT-350 Hertz Fastback) This is a genuine Raven Black 1966 Mustang Shelby GT-350H Hertz fastback. These where built for Hertz to be rental cars. (5 photos of a 1966 Raven Black Mustang Shelby GT-350 Hertz Fastback) This Raven Black 1966 Shelby GT-350 Hertz Mustang fastback was at the 2010 Mustang Club of America Grand Nationals held in the Seattle area of Washington. I waited most of the day to get these shots. It was cloudy most of the morning and then the hood was only partially opened. The gold stripes on this car were amazing. You could see them from a long ways off. (1 photo of a 1966 Mustang Shelby GT-350 Fastback Advertisement) Check out this cool 1966 Mustang Shelby GT350 magazine ad. It's the "Son of Cobra" advertisement. It says that the car can go 0-60mph in only 5.7 seconds. (1 photo of a 1966 Ivy Green Mustang Shelby GT-350 Convertible) The 1966 Mustang Shelby came in 5 standard colors, this Ivy Green is one of them. This GT-350 with aftermarket wheels and customized engine was at the 2010 Mustang Club of America Grand Nationals held in Bellevue, Washington.